I am hoping to see a gym at the space available next to Lowes. Hi Robert. Thanks so much for the update. However, please clarify if it is PetSmart or Petco. They are two different store chains. Thanks again and happy new year. Thanks for the catch, its a petsmart! Please, please have a craft store such as Michael’s or A.C. Moore. The people in this area have to go all the ay to Laurel or Bowie for a craft store. One is badly needed in this area. I agree. Or a fabric/craft store. Last I heard a YMCA was expected to build out and move into the former Thurgood Marshall Elementary School in Fort Lincoln. That should meet the community’s need for a contemporary gym. My Fort Lincoln neighbor, Ron Jackson (The Villages), recently pointed out to me that the highest priority for the remaining big box space in the shopping center has to be a quality grocery store — such as Harris Teeter or Trader Joes. Either of those chains can design a botique store that will fit in 35,000 sq. ft. A quality grocery store will not only meet a pressing need for this entire area but (for that reason) will also increase surrounding residential property values more than any other retail option I can think of. Thanks for the update Robert. Good Info. Any gym with a 25-yard(or more) indoor swimming pool would be great! I think the swimming pool near Eastern Market is the closest one. Here’s a great online article in the Washington Business Journal about the future of Shops at Dakota Crossing. In addition to Marshall and Petsmart, Dicks Sporting Goods is also coming to the area. No plans for a grocery store or a fitness center. 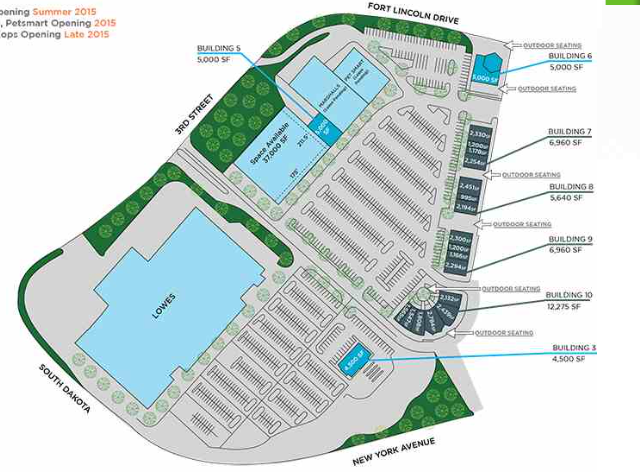 It seems like developers totally ignoring the residents of Fort Lincoln by building a huge shopping center with box retailers and bringing more traffic in the community. Personally, my need to shop in Dicks is probably once-twice a year and i can totally do it online. The article above states that Dicks might go down under private equity giant, and here we, as a community, becoming powerless. No grocery store, no gym. Feel free to send me a formal letter even if by email and I will push it to explore our options. The way the application was filed, the smaller shops along the main street were intended to be neighborhood-oriented retail, the application also specifically called out a grocery store. I don’t know the particulars now but should have a better understanding of what the plan for this shopping center is in the coming weeks. My opinion isn’t as important as the residents who are also affected by this development. I just think going from a Target, Shoppers, Costco & Marshalls to a Lowes, Dicks, Petsmart, Costco & Marshalls is cardinally different. The objective was to benefit DC Residents with the wave of micro units and smaller residential homes, I don’t see how a Dicks is aligned with the objectives of the urban-renewal development. Any updates on The Shops? Specifically, which small restaurants/stores are coming? I agree. No need for a Dicks. Also would like to see some nice eateries come to the area. I love all the new changes at market street, especially the Lowes, it would be nice to have a grocery store, such as Trader Joe’s or Shoppers, restaurants, & please please AC Moore or Hobby Lobby. Are there any plans for a craft or fabric store? Just 5 Below based on what’s been leased thus far.